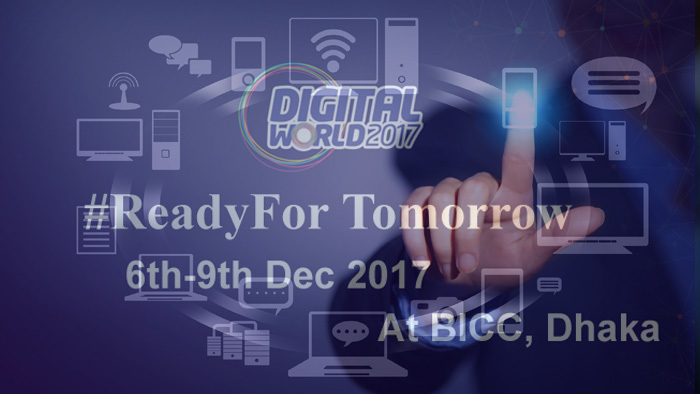 Ready for Tomorrow-- the theme of "Digital World 2017"-- signifies the readiness that Bangladesh has achieved over the past 9 years in ICT sector. Bangladesh, an emerging leader in ICT World, is ready to transform its IT industry as a noble-hub for the rest of the world. Human resources and infrastructure is ready, BSS reports. The largest ICT Expo of the country namely "Digital World 2017" (DW17) is going to be inaugurated on December 6 under the banner of ICT Division, Bangladesh. Prime Minister Sheikh Hasina is expected to inaugurate the mega event on the day. Regarding the arrangement of Digital World 2017, Minister of State for ICT, Zunaid Ahmed Palak said, "Under the bold leadership of Prime Minister Sheikh Hasina and direct supervision of Prime Minister's ICT Affairs Adviser Sajeeb Wazed, Bangladesh has achieved a lot towards achieving the Digital Bangladesh. He added. "We are providing policy support and incentives to all of the stakeholders, duty exempts to the required parts and raw materials for hardware assembling and production, established digital infrastructure, and Bangladesh has sufficiency in efficient workforce." "Bangladesh is ready now in every aspect of the ICT-ecosystem. Through the Digital World 2017, we will showcase our developments to the local and international IT giants. I also invite our people to come in Digital World and differentiate the current Bangladesh," Palak added. The state minister also said, "We along with our gigantic skilled human resources and world-class infrastructures are striving our heart and soul to cope with Fourth Industrial Revolution (4IR) that will fundamentally alter the way we live, work, and relate to one another. Thus, DW-17 is going to be a great revolution of philosophy in IT Revolution for our new generation to materialize the technological vision called Digital Bangladesh." This multi-facet expo will be providing a platform to establish network with the local and regional/global IT-ITES industry leaders and experts with a view to share their best practices and experiences. In this four-day event (6-9 December), more than 200 spokespersons from top IT organizations including Google, Nuans will address various sessions of the exposition. The exhibition this year will be composed of various major expositions and notable elements like e-Governance Expo and software showcasing. More than 300 stalls and pavilions for IT Exposition, more than 24 seminars, conferences and policy dialogues, ICT Career Camp which will occupy various zones. Corners namely Software Showcasing, e-Governance Zone, e- Commerce Zone, Gaming Zone, Experience Zone, Startup Bangladesh Zone, Mobile Innovation Zone, Made-in-Bangladesh Zone will be set up in the event. DW-17 aims to connect investors, innovators, entrepreneurs, industrial leaders and IT workforce of the country. The ICT Division, in association with Bangladesh Computer Council (BCC), Bangladesh Association of Software and Information Services (BASIS) and Access to Information Programme (a2iProgramme) of the Prime Minister's Office of Bangladesh will organize this mega event. For making it a success, ICT Division is also collaborating with leading trade bodies of the country like Bangladesh Association of Call Centre and Outsourcing (BACCO), e-Commerce Association of Bangladesh (e-Cab), Bangladesh Computer Samity (BCS) and professional bodies including Bangladesh Computer Society, Bangladesh ICT Journalist Forum (BIJF), Bangladesh women in IT (BWIT) and CTO Forum.